ENTERTAINMENT THAT FEELS AS GOOD AS IT LOOKS. Beautiful visuals prevail on this slim and light tablet. Class-leading battery life and all the connectivity you need will keep you online and entertained. Enhanced for entertainment and designed to impress, the 10.1" IdeaTab S2110 Tablet uses cutting-edge technology to deliver an optimal entertainment experience. 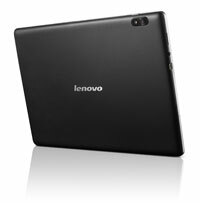 It's powered by the latest Android operating system, Android™ 4.0 Ice Cream Sandwich, and a cutting-edge, dual-core Qualcomm processor. At a mere .34 inches thin and just 1.3 lbs light, the IdeaTab® S2110 is portable enough to take anywhere. It's also engineered for comfortable use — its matte-textured back panel makes it easy to grip and hold. The extra-bright HD display uses in-plane switching (IPS) technology to produce crisp, vivid images — even, unlike most tablets, when you look at it from an angle. And dual speakers enhanced by SRS® TruMedia deliver stunning audio with a rich bass response.